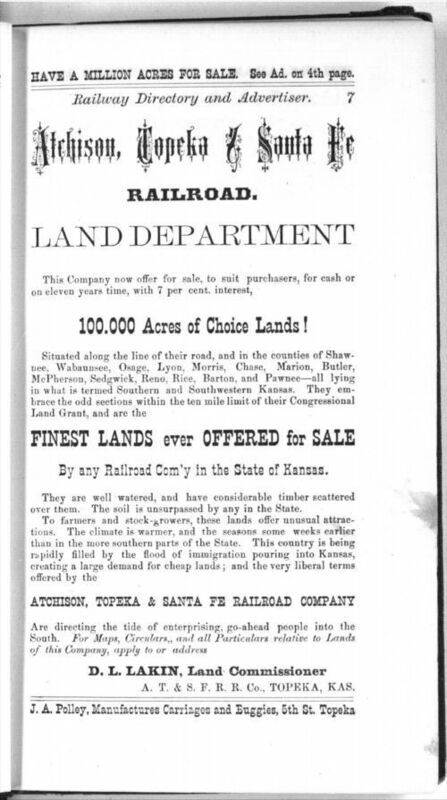 This advertisement promotes the sale of 100,000 acres of land along the line of the Atchison, Topeka, and Santa Fe Railroad. According to the ad, these lands have fertile soil and "considerable timber," and are in such high demand that white immigrants are flooding the area. This is an excellent example of an advertisement promoting land sales. It can be used in the classroom to demonstrate how white settlement was encroaching on Indian lands.